A new psychological thriller starring Amy Adams premiered on HBO last week. The miniseries, directed by Jean-Marc Vallée, is based on Gillian Flynn’s debut novel Sharp Objects. If you happened to catch the premiere, then you may have fallen in love with Camille Preaker’s (Amy Adams) family mansion. While the mansion plays the role of a much older counterpart, the real structure was actually built in 1997. It appears the production only used exterior shots of the real home and either created interiors on a soundstage or used an additional home for interior shots. 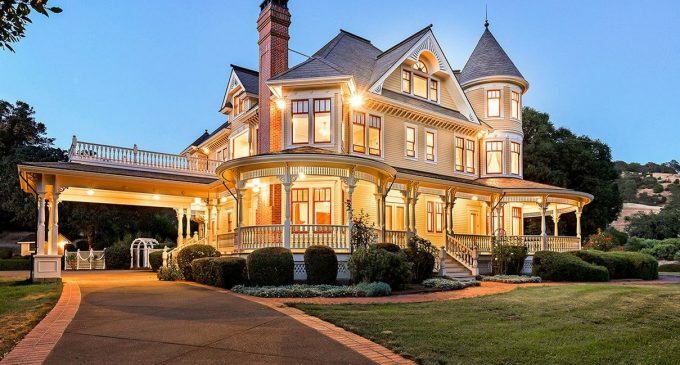 Designed in the Queen Anne Victorian style, the 7,500 square foot, 5 bedroom and 4 bathroom residence is a faithful reproduction of an 1880’s Victorian home with modern systems and amenities. The construction mirrors the original techniques with plaster over button board, old growth Douglas Fir flooring and Redwood siding, framing and trim. The workmanship must be seen to be appreciated with period or reproduction fixtures used throughout including push button light switches. What sets this property apart from the rest is the land it sits on. Known as East Ranch, the property spans more than 1,745 acres in Redwood Valley, California. The extensive estate includes 24 miles of maintained roads, a redwood grove, archaeological site, 21 ponds, 4 freshwater springs as well as a 4,900 square foot barn, gazebo, 1,600 plants and shrubs and a modest orchard containing apples, pears, peaches, nectarines and pluot. East Ranch had previously been on the market for $8,000,000 in 2015 before heading to auction on September 17, 2016 with Platinum Auctions. The property had a reserve of $3,000,000 and sold for $6,215,000. Sharp Objects follows a reporter as she confronts the psychological demons from her past when she returns to her hometown to cover a violent murder. The miniseries airs Sundays on HBO.